While in Florida in late November, I hiked the La Chua Trail in Paynes Prairie Preserve State Park in Gainesville. I walked to the observation tower at the end of the trail, which extends about a mile into the prairie basin. It was an unusual morning, because I had the entire trail to myself. After spending about an hour on the observation tower, I turned to leave, and as I did, I thought I saw unusual movement about 100 feet away along the edge of the trail. I stopped and looked more closely, but could not make out what it was, but I was certain it was not one of the usual birds or other wildlife that are frequently seen on the trail. I approached the area where I saw the movement very slowly so that I would not frighten whatever it was off. From the glimpse of the animal that I had from the tower, I hoped it would be a Bobcat. I stood in the area where I thought the animal went off the trail and carefully looked around for about ten minutes, but could not see it. Then, I spotted it, and it was starring straight at me, not moving (above image). And that is when I was certain that it was a Bobcat. 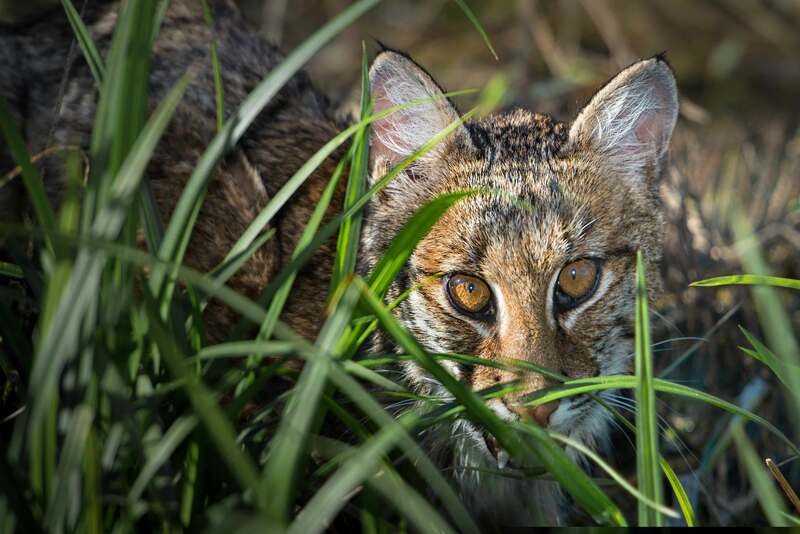 I had my Nikon D800 with a Nikon 70-200mm lens and a TC20 teleconverter, as well as a Nikon SB-910 Speedlight with a Better Beamer mounted on it, and I began photographing the Bobcat. 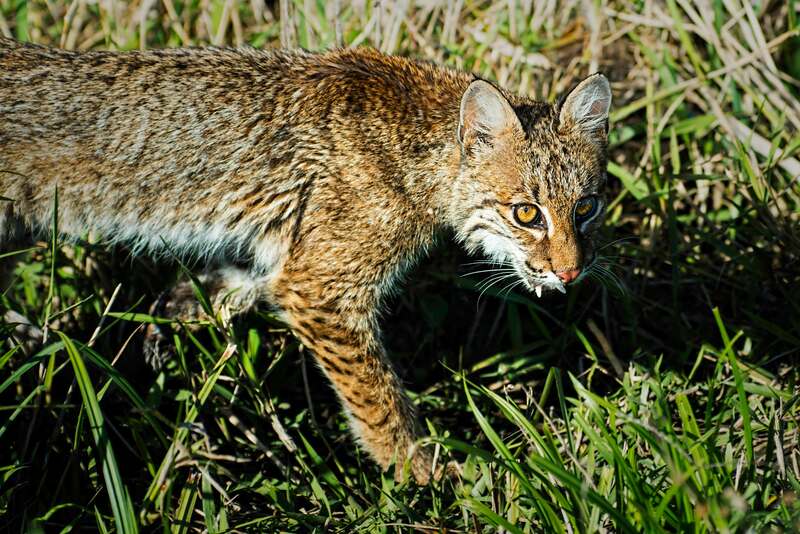 It was amazing–the Bobcat stayed tucked into the tall grass as I fired shot after shot. Eventually, it must have realized I was not going to harm it, and it walked out from the grass and ran down the trail, where it turned into the vegetation along the trail and out of sight. I tried to locate it again, but could not. Bobcats live in North America from southern Canada to northern Mexico. They are roughly twice the size of a domestic cat and are very territorial and most solitary predators. They have distinctive black bars on their forelegs and a black-tipped, stubby tail, which is how they got their name. They are typically nocturnal and avoid people. I probably was able to see and photograph this Bobcat because I was the only person on the trail that morning. It was my lucky day. 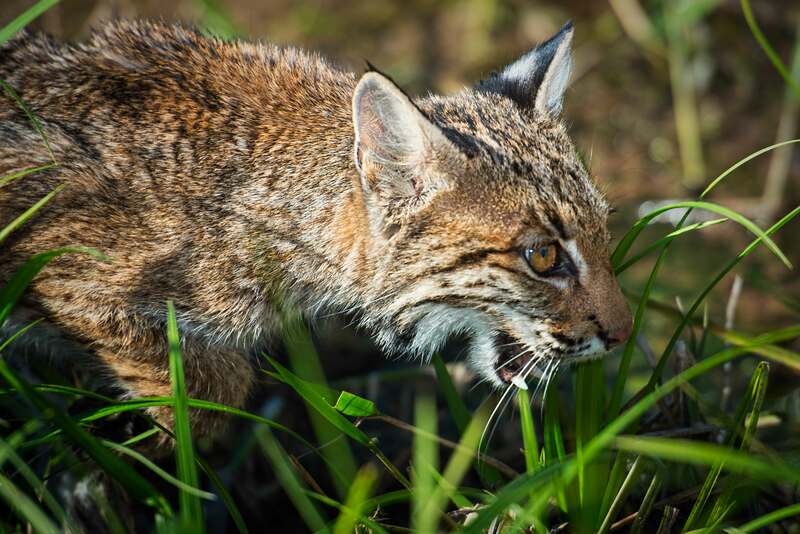 This entry was posted in Nature, Paynes Prairie Preserve State Park, Wildlife and tagged Bobcat, paynes prairie preserve state park. Bookmark the permalink. Great shot Steve. Those guys are hard to find. Nice capture! So beautiful, Stephen! I am glad you were able to see and photograph the Bobcat. They are rarely seen in Georgia where I live. Nice post Steve! Enjoyed seeing these great shots again and learning about how you captured them. It is a beautiful animal and I’m glad you were able to find it. It was your lucky day! I’ve always found them to be very skittish and run at the slightest movement. Fantastic pics! Awesome Stephen! I almost missed this! Great shots as usual, Steve! I would have been scared to death and not be able to move a finger in this situation. But you captured this Bobcat wonderfully.